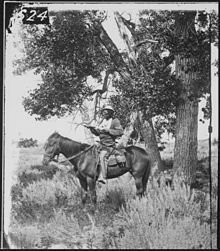 As the Army pursued the Indians through Idaho into Montana, elements of the 7th Cavalry joined the chase. Major Lewis Merrill and Captain Frederick Benteen, a veteran of the Little Bighorn, each led a battalion of the 7th. Merrill's Battalion consisted of Company F (CPT James M. Bell), Company I (CPT Henry J. Nowlan), and Company L (1LT John W. Wilkonson). Benteen's Battalion consisted of Company G (1LT George O. Wallace), Company H (2LT Ezra B. Fuller), and Company M (CPT Thomas H. French). In September 1877, these battalions were with COL Samuel D. Sturgis's column when they caught up to the Nez Perce raiding ranches up and down the Yellowstone River. The 7th Cavalry troopers were exhausted from their forced march and anticipated a rest after they crossed the Yellowstone River on the morning of September 13, but Crow scouts reported the Nez Perce were moving up Canyon Creek six miles away.